Universal Studio Orlando’s newest parade is the hit of the park. Focusing on some of the most popular animated characters today, Universal’s Superstar Parade was a welcome break from all the walking around we did that day. The downside to watching most parades is getting a good seat takes holding down a piece of pavement for an hour or more. The popularity of this parade makes this no exception to the rule. We were fortunate enough to secure a spot at the first show stop of the parade. This gave us a perfect seat to watch Hop, the Minions and SpongeBob boogie down to the beat. After we had a chance to take it all in, I was given the chance to ask Lora Wallace, the show director for Universal Orlando Resort Entertainment, some questions about the parade and what it takes to put it all together. Lora has worked at Universal Orlando for sixteen years. With various roles under her belt (talent manager, choreographer and assisting in theme concepting), she first started her work at the resort with a parade associated with Halloween Horror Nights, followed by a decade of involvement with Universal Orlando’s annual Mardi Gras parade and Macy’s Holiday Parade events. A few of her roles allowed her the opportunity to work on The Beetlejuice Graveyard Review, Bill and Ted’s Excellent Halloween Adventure and How The Grinch Stole Christmas . 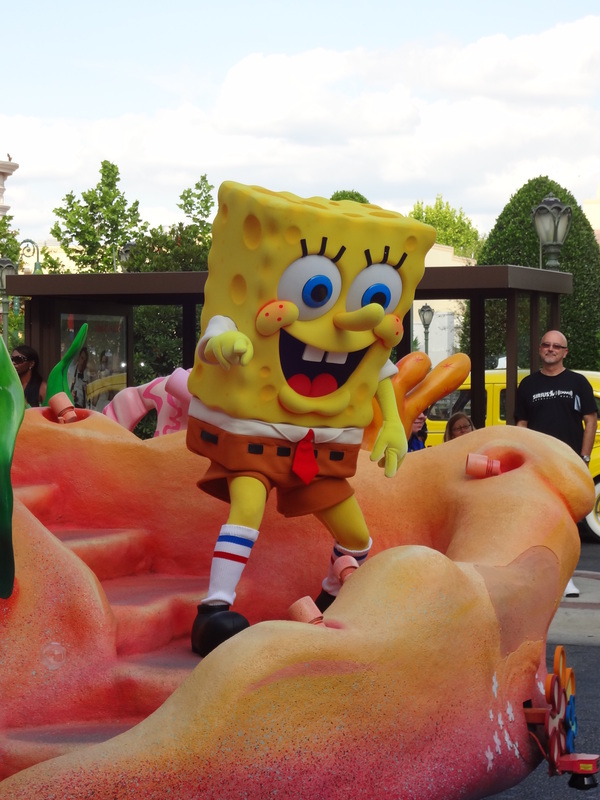 GeekMom: Why were the characters in the parade chosen to have a float or a part in the parade? Lora Wallace: All the characters in the Universal Superstar Parade are loved by so many people and are all fun for the entire family, so we felt they were the best fit for our new parade. GM: How many people did it take from idea to first show to make this happen? LW: It took a small group of people to start then as the concepts and production grew we grew into hundreds of talented people. GM: What float was the most fun to work on? LW: All of the floats have something different and special – The Dora and Diego float features swinging, tumbling monkeys on vines; the SpongeBob SquarePants float features colorful fish on roller skates; The HOP float comes equipped with a slide and marching band style drummers; and the Despicable Me float incorporates the best elements from the film, as well as our favorite characters, Gru, Edith, Agnes, Margo and the minions. They really are all special in their own way and I’ve enjoyed working on bringing all of them to life. GM: What kinds of things do you take into consideration when planning out the show stops and parade path? LW: We looked at the best part of the park with the most viewing area for parade and show stops. We wanted to ensure that all our guests got a great view and were able to see all their favorite characters. GM: The costumes were amazing! My favorite outfit was the one worn by the minion dancers. When planning out the attire for the performers, did you get input from any of the cast or crew that would be wearing them? LW: As I was a dancer, I was able to get into the costumes and make sure that the choreographed movement was able to be performed while also ensuring the costumes stayed true to the fun-loving nature of these characters. GM: What is the typical timeline for a project like this to go from idea to first show? LW: The timeline for each of our productions varies on the show. This particular parade was a few years in the works from the first concept to the final product. GM: Tell me a little bit about the technology that is incorporated into the floats that is special or different from other parade floats. LW: The Universal Superstar Parade floats have hundreds of speakers on them, lots of animatronics and moving parts and tons of LED lights. 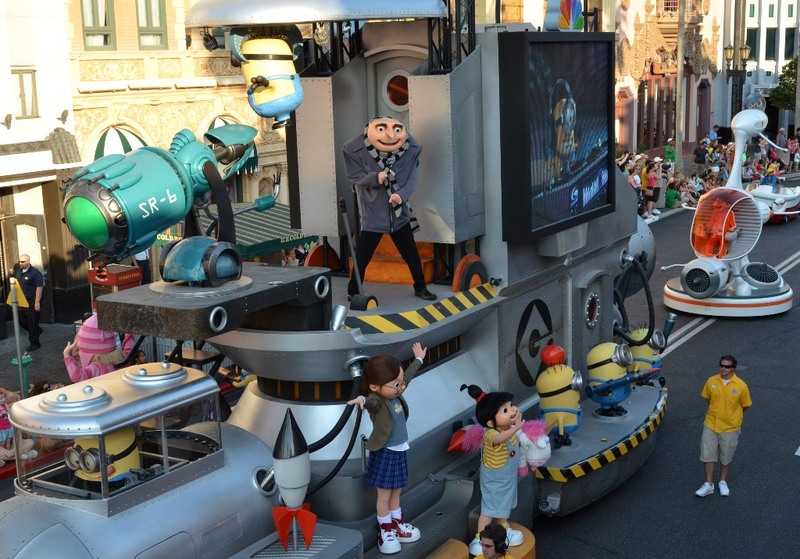 The Despicable Me float also features two huge hi-definition LED video screens featuring a Minion music video for all to enjoy. Each of these floats is also equipped with GPS so that each movement of the floats is choreographed and the floats end up in exactly the right place during the show stops for every parade. I was given park tickets to check out Universal Orlando’s Superstar Parade. Though I received this benefit, I have given a review that is completely my own.